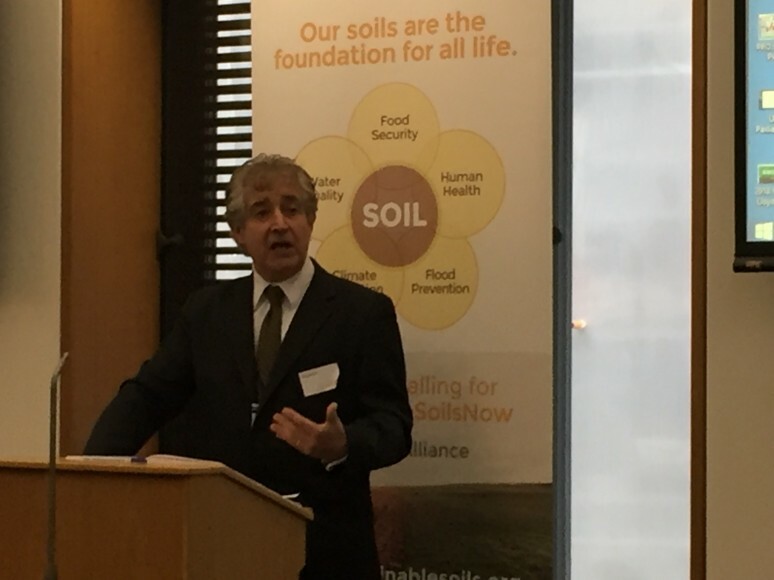 The target, contained within the government’s recently published 25-year plan for the environment, was up for discussion at the event hosted by the Sustainable Soils Alliance and Defra’s Parliamentary Private Secretary Rebecca Pow at Portcullis House. 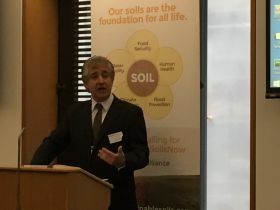 The debate was structured around eight specific policy asks developed by the Sustainable Soils Alliance to help restore the health of the nation’s soils within a generation. These include proposals for a robust regulatory framework to introduce monitoring and measurement of the country’s soil. Speakers at the event included experts from farming, industry, NGOs and academia, as well as MPs and Defra representatives. They united in calls for urgent action to restore the UK’s soils, the organic matter of which has been depleted by decades of intensive agriculture, damaging water and air quality in the process. WWF’s executive director for advocacy and campaigns, Tony Juniper, said: “We have destroyed the organic matter in many soils and at the same time, through the use of heavy machinery and the overgrazing of animals, we’ve compacted other soils. Juniper added that “soil damage is one of the reasons why we’re seeing a loss of biodiversity in both fresh water and costal marine systems” and said coral reefs were being impacted by sediments running off from the land, very often linked to unsustainable farming. He praised the government’s 25-year plan for being “very well made” and a “very welcome document”, but stressed the need for a new act of parliament to bring its key objectives into legislation. Rather than enforcing its soil health plans with penalties for non-compliance, Craig Sams of the 4 per 1,000 Initiative called for the government to incentivise producers to adopt environmentally friendly practices. His initiative, which was launched at the Paris climate conference in 2015, states that if farming and forestry increase soil organic matter by four parts per 1,000, we can completely offset the 16 billion tonne annual increase in greenhouse gases. Sams called for the government to follow France’s example of introducing a carbon tax. “The French have already set a €56 a tonne carbon tax, which will kick in in 2020,’ he said. “If everyone had to budget €56 a tonne for every net tonne emitted, they could purchase tax-reducing offsets from forestry and farming. “Some organic and biodynamic farmers are on record as increasing soil organic carbon by seven parts per 1,000. If everyone farmed like that, we’d be seeing a 12 billion tonne net annual reduction in greenhouse gas levels without any resort to solar and wind, which is coming anyway. In order to achieve this kind of change, Defra minister George Eustice stressed that the tension between environmental NGOs and farmers needed to end. “If we talk about the environment, farmers say you don’t care about food production, and if I talk about food production, NGOs say: what are you going to do to our environment? On a similar note, the NFU’s environment forum chairman Mark Pope warned that progress towards improving soil health “could be slowed if farmers are portrayed as villains, when they’re actually very much part of the solution”. Pope praised farmers for adopting measures to boost soil health such as cover cropping and minimum tillage, saying awareness of the importance of investing in soil health was at an all-time high. “I think we’re about to enter a new phase of farming – a soil health revolution,” he said. Closing the debate, the Eden Project’s co-founder Sir Tim Smit urged people to view themselves not as consumers, but citizens “with a duty to the future”.